TÜV SÜD has transformed itself from a test institute dedicated to the minimization of technical risks to a service corporation. Its fields of operation have expanded in line with technological development. As responsible process partners, the experts and technical consultants now supervise the entire value-added chain of their customers in many sectors – true to the motto “More safety. More value.”So you could say that far-sightedness has long been in demand. The virtue is certainly very much in evidence in the technical renovation of the 1980s-built administrative building at the group's headquarters in Munich. The project also involved designing the video-conference room on the floor occupied by the management board, a task for which the local architectural office terrain:loenhart&mayr was responsible. Architect Christoph Mayr wanted to create a “command centre” which would be conducive to concentrated working and logical decision-making. The room proved something of a challenge due to its size, its various occupancies – such as seminars, conferences and multi-media presentations and the technical equipment, which included a complex rear-projection system, video and sound equipment. The demands on the lighting solution for the room, which is designed as an elongated octagon, were equally challenging, as the cooling ceiling for dissipating the heat from the media equipment, and the ventilation equipment located behind it left an available room height of just 2.50m. This meant that built-in luminaires were not an option. The extremely attractive alternative consists of a very low-profile, suspended luminaire structure. Forty ORBEOS OLED panels from OSRAM perfectly combine with 26 LED modules – used as uplights and downlights – to create a light installation with a wonderfully weightless look. Its form precisely mirrors the contours of the table designed by terrain:loenhart&mayr. The octagonal basic shape of the ORBEOS OLED panels, which are a mere 1.8 mm thick, inspired Christoph Mayr to design this cluster-like arrangement, creating a freely configurable structure which can assume any organic form. The result is an extraordinary luminaire with ORBEOS light panels from OSRAM that enhances the prestige of the conference room. 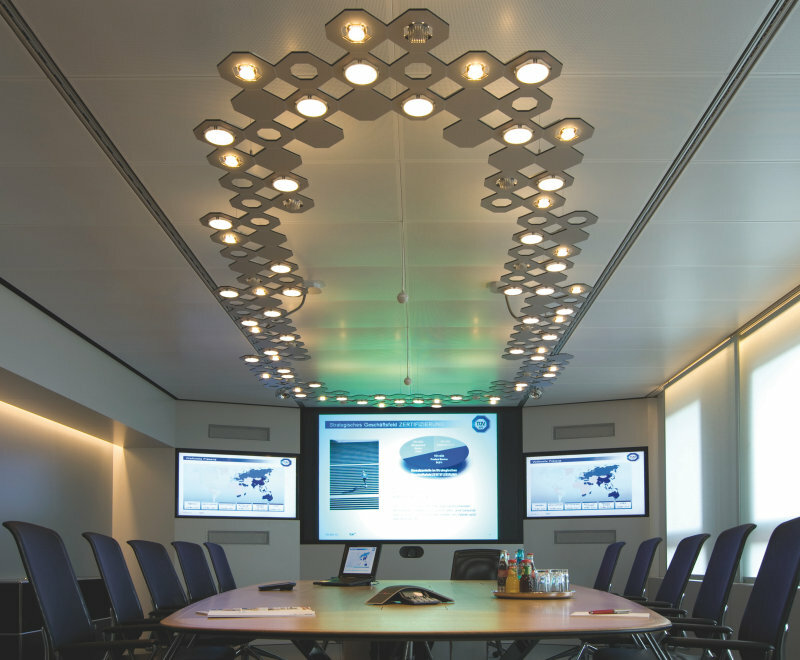 As an additional bonus, the indirect light component brightens the ceiling, making the room seem higher and pleasantly illuminates the faces of the participants in a video conference. By lucky coincidence, the basic shape of the ORBEOS even matches the octagonal logo of TÜV SÜD, whose corporate philosophy of innovation is reflected in the pioneering light solution. Thanks to constant-current control using the e:cue DMX2CC dimmer, this first commercial OLED installation from OSRAM offers flicker-free dimming – an important requirement for video-conferences. This also ensures that it is simple to configure and retrieve lighting effects which are tailored to specific occupancies in the conference room. After all, lighting scenarios of this kind are considered to be a key design element, representing corporate values and creating an attractive room atmosphere. A welcoming mood is needed at the reception, followed by accentuated lighting to promote concentration during meetings. Video-conferences are a special situation, requiring light which is as homogeneous as possible with excellent colour rendering and no disruptive, hard shadows. The e:cue control system from Traxon can be used for infinitely variable dimming of the conference table lighting in two groups, and for integrating other lighting components, such as LED strips. But the exceptional features don't end at the appeal of the lighting and the room itself. Norbert Peischer, Engineering Officer at TÜV SÜD has confirmed his appreciation of the hitch-free process as a whole, comprising every single step from design and punctual delivery to installation – a task handled by OSRAM's project partner, Korona Leuchten, Augsburg.